Triatomic molecules are molecules composed of three atoms, of either the same or different chemical elements. 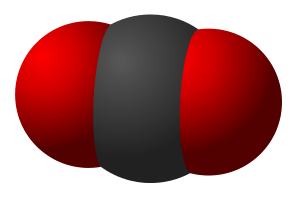 Examples include H2O, CO2 (pictured) and HCN. The vibrational modes of a triatomic molecule can be determined in specific cases. In the previous formulas, M is the total mass of the molecule, mA and mB are the masses of the elements A and B, k1 and k2 are the spring constants of the molecule along its axis and perpendicular to it. 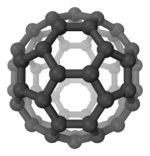 Homonuclear triatomic molecules contain three of the same kind of atom. 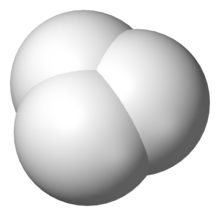 Ozone, O3 is an example of a triatomic molecule with all atoms the same. Triatomic hydrogen, H3, is unstable and breaks up spontaneously. H3+, the trihydrogen cation is stable by itself and is symmetric. 4He3, the helium trimer is only weakly bound by van der Waals force and is in a Efimov state. Trisulfur (S3) is analogous to ozone. ↑ Kunitski, M.; Zeller, S.; Voigtsberger, J.; Kalinin, A.; Schmidt, L. P. H.; Schoffler, M.; Czasch, A.; Schollkopf, W.; Grisenti, R. E.; Jahnke, T.; Blume, D.; Dorner, R. (30 April 2015). "Observation of the Efimov state of the helium trimer". Science. 348 (6234): 551–555. doi:10.1126/science.aaa5601.